Dr Jan Zigmund was indeed with us at the latest meeting at Old Warden, where much rocketeering was achieved. Jan brought over a batch of the smaller L-1 motors and a selection of 'L-2X' and L-2-LT motors. I bought some of these and will report on their performance in a separate forum thread. I hope this topic will include flying reports from Andy Blackwell, Howard Metcalfe, John and Mark Digby and others. Above: Mark and John Digby, Andy Blackwell, Chris Richards, me. Note Andy's ballistic rocket. 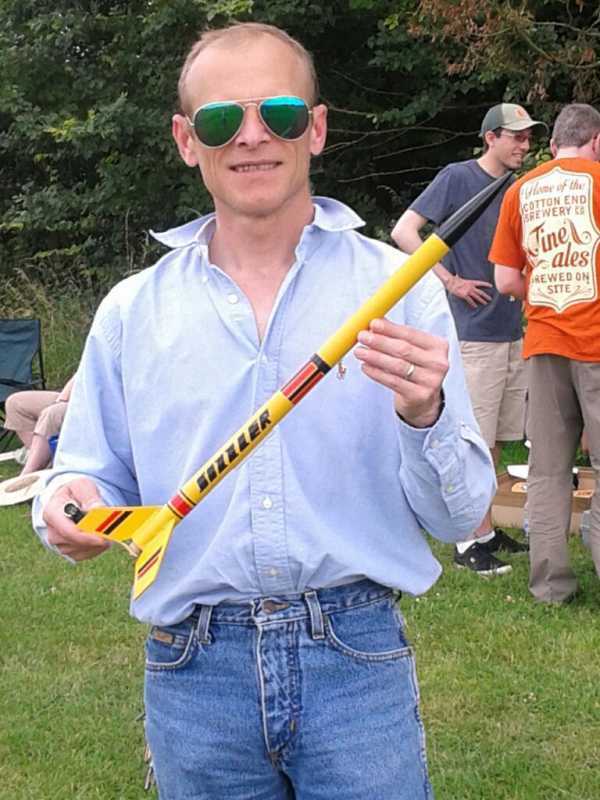 I am holding a replica Keil Kraft Shooting Star powered by a genuine Jetex 50B. Above: Andy with his Estes rocket. But he also flew his T-38 - which possibly went higher on occasion! In brief, Saturday was a flat calm but oh so hot, Sunday was windy but quite flyable. Andy made some spectacular sorties with his favourite T-38; Howard's models went very well, with a splendid last flight of his MiG 29 on the Sunday. I think Dr Z was duly impressed, said he had enjoyed himself, and woulfd be back next year. The weather was here and I wish we were beautiful! Saturday was everything we'd hoped for in the way of weather. I should have gone straight onto the field instead of looking at the 'shmutter' on the traders stalls. It was hot though, so with dad in tow I headed to the shade of the trees on the periphery. Alas, the health and safety brigade have finally collared us; we now have a defined flight line! This is in the form of marshal-installed set of poles connected with red white striped tape forming a line. And, no free flight models over 3 foot span and weighing over 1kg. Well, we're ok then! However, people still got clumped by errant models, Chris had one bounce off his nut and I had two in the beuttoxx, no damage though. The Estes rocket is a loft kit resurection from the 80's coupled to a year-old promise to give a school demo of a real rocket and what it can do! I only had time for one 'shot' so I had 5 unused motors left over so, why not? I might try an Evel Knievel skycyle next, if I can get the parachute to release on take off! 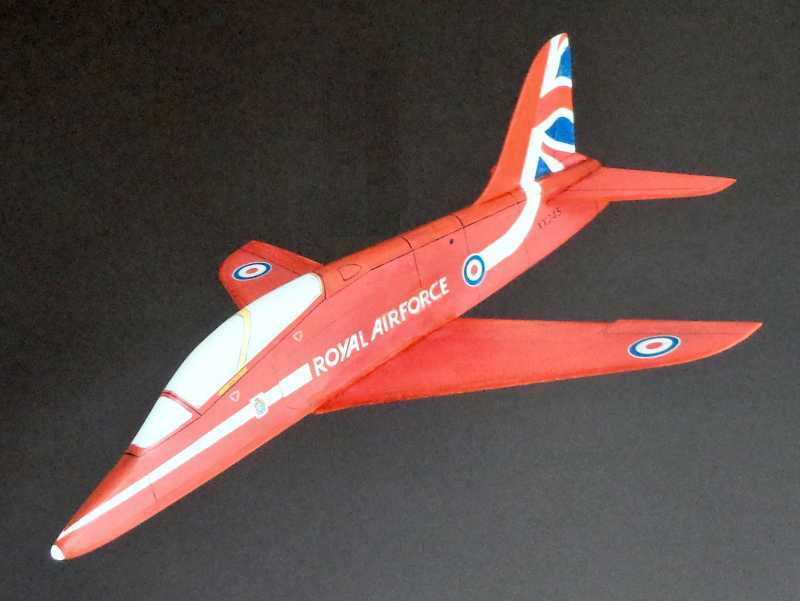 Of matters Rapier, I cobbled together a Red Arrows hawk kit from Roger, but I should be flogged for making it look more than a little 'par boiled' I rushed it and struggled with it but ! was optimistic it would fly, which it does with just some noseweight. Above: The Thunderbird T-38 is Andy's favourite model and seems to cpe well with any weather conditions or any type of L-2. Low power - nice cruise around the field ...with an L-2X - climbs high and cavorts about the sky! The T-38 needs no introduction, and then there was also some tree shaking to be done when a Chris Richards prop job got stuck in the high canopy of a tree. I got some motors from Dr Z; the L2-LT's are nothing like LT's of old, they are in effect a standard L2 [ see the test results on an allied thread ] . The L2-X motors are what we have come to expect of L2-HP's. There it is in a nutshell. Sunday was a blow(10 mph and upwards) all day long, but it didn't stop us, but there was a lot of re-kitting of wings and parts. 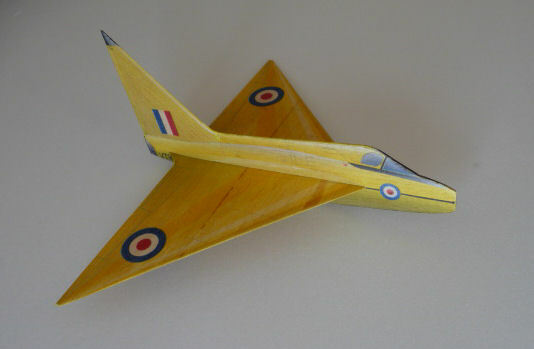 I did spot the estimable Crossleys, and Pete Smart had 'gulp': a really nifty twin EDF Depron r/c Concorde. This was an indoor model (from Micromodeldrome) which hung in the Sunday breeze just nicely... I want one. Above: the flightline at Old Warden, introduced as a safety measure. Judging the best place to put it was not easy, and it was moved upwind early on Sunday because of the strengthening wind. It would be fair to say this new innovation [sic] was not univerally appreciated or adhered to. Saturday was scorching hot with practically no wind and the attendance was good. The flying was also good and plentiful - conditions were perfect apart from gusts later on occasioned by a thermal passing through. Sunday however was cooler and windy, but thanks to the lack of trees and buildings upwind it was surprisingly free of the dreaded turbulence once you were above 20-30 ft off the ground. So, although many there didn't bother to fly because of the stiff (12 mph) breeze the models that were flown flew perfectly well and even stayed in the field, well for me anyway, which was a nice change. During the seven hours I was on the field [mad dogs and Englishmen!] 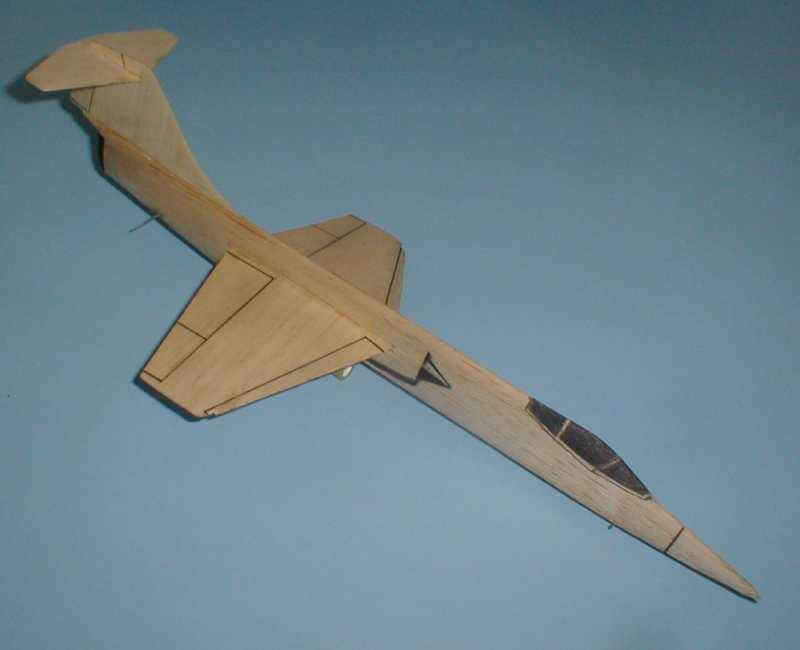 I initially flew some of my paper dart power unit powered Depron profile motors to get a feel for the conditions and then progressed to my Rapier powered profile Comet, Valiant, Skyray and BP 111A and semi profile Saab Viggen and MiG 29 and the built-up Swift. Above: Howard's profile Comet made a number of flights, exhibiting a number of aerobatics which would have required passengers to fasten their seat belts (and probably reach for sick bags). A lovely flyer. Above: the Valiant has a side mounted motor and thrust tab. It's quite sensitive to what thrust the L-2 gives. 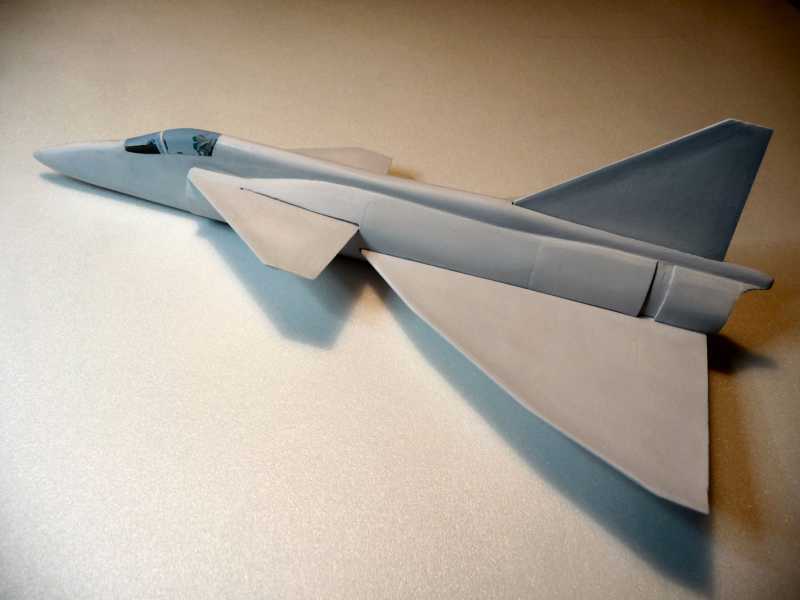 Above: Howard's take on Bill Dean's classic Skyray. It made some lovely sorties. Above: Howard's BP 111A prefers the ~ 90 mN of the old L-2 LT motors to the ~140 mN of the new ones. I'm sure it could be trimmed to take the extra oomph, but who wants to 'waste' motors doing this? Both the Comet and Valiant gave me a fright on their first flights as they glided away in straight lines away from me after the power run. They were hard to see and appeared to disappear very low over ther hedge in the distance. "Oh no, got to get through the hedge and search amongst the crops" I thought. But as I walked up to inspect the hedge ... just in case they had not gone over and were stuck in it I found them in the grass not far short of the Hedge. Hooray! The Skyray did its usual variety of flights, depending on the variability of the power of each particular Rapier as each one does vary a bit. Generally it gave nice smooth climbing circuits on moderate power, or random loops and steeply banked turns on the more potent ones. But it is such a reliable flyer it could cope with varying thrusts and I would recommend it to anyone. The highlight of the day for me was seeing the Mig 29 (from the Aeromodeller design) circling in banked turns above my head and drifting slowly downwind then going off to one side in a straight line in a nice long glide, a lovely end to the day. On Sunday I spent only six hours on the field[!] but in that time got to meet with Dr Z. I found him to be a very nice chap and bought some new Rapiers from him to top up my stock. 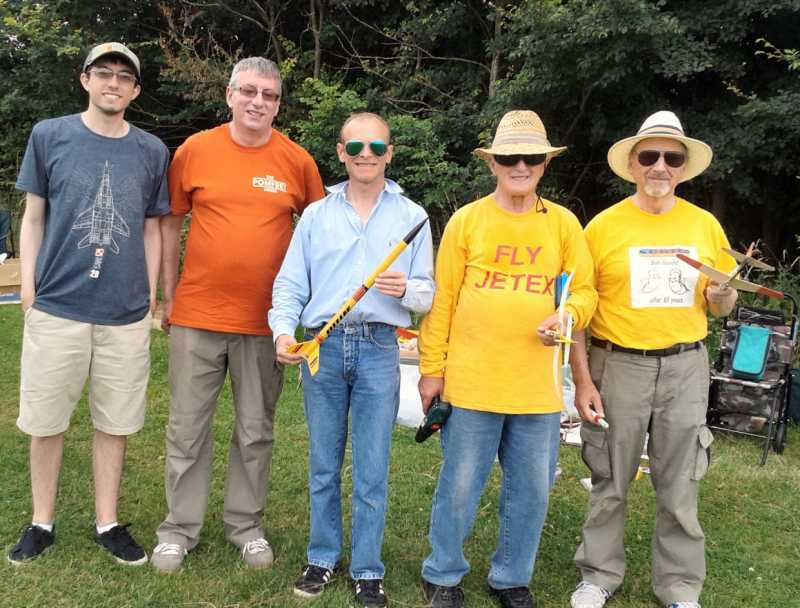 There were also lots of other fliers to meet on the field, one of the pleasures of such meetings, and I found them all a very nice bunch indeed -- to a man helpful and informative when asked about their models. I flew less on Sunday as I was still tired from Saturday, but fly I did and I am very grateful to Andy and Roger and another chap who volunteered to collect my models at times from the other side of the field. A big thank you to you guys. So what did I fly? ... basically the same Rapier models as Saturday plus a profile Starfighter, but I managed to damage the Swift, Valiant and BP111A when the extra power of the newer L-2 Rapiers caught me out. These profile models are easily repaired thankfully. I should have selected the next lower power grade i.e. a standard L-2 instead of an L-2X, as higher levels of power require the models to be re-trimmed -- it seems the rule that the faster they fly the harder they are to trim. But, all in al, a good time was had by all. Long may these meetings continue! Above: Howard's beautiful Swift flew well in Sunday's windy conditions ... until the inevitable CRUNCH! 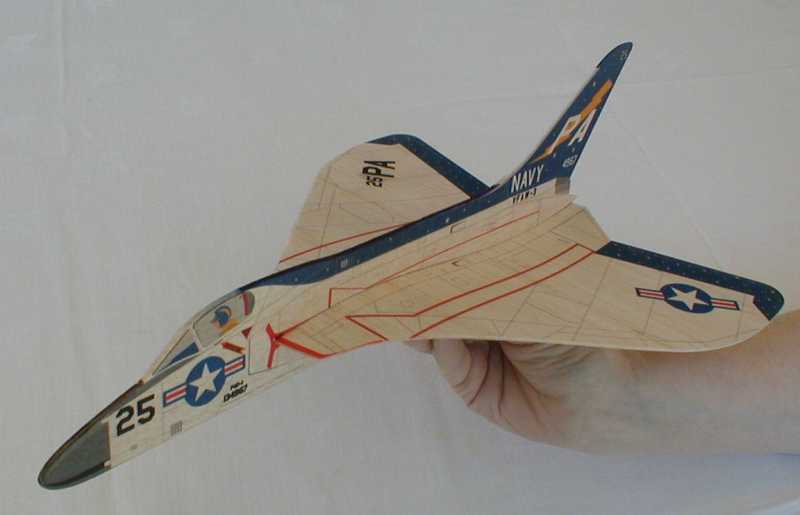 All balsa models tend to bounce better. P.S. Personally I could have done without the flight line and also the so-called radio assist models sharing the same space as our genuine free flight models. 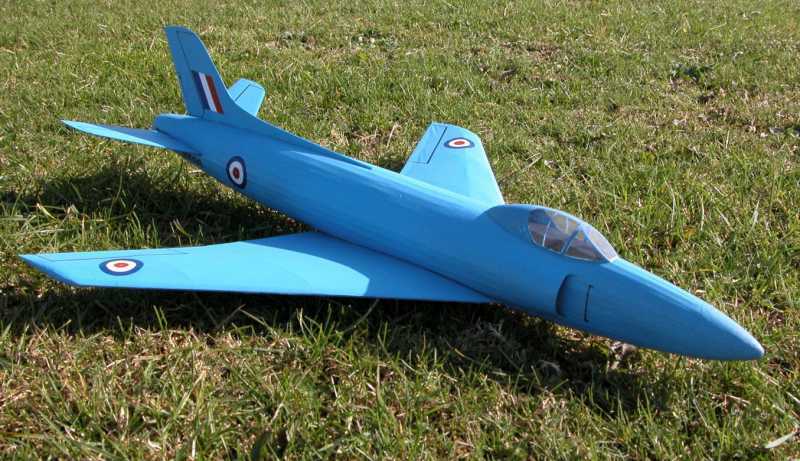 There were two flights that shared flight of the day for me on Sunday, the first was my near twenty year old balsa profile Starfighter which needs a catapult launch (kindly assisted by Andy lighting the Rapier) as it is very tricky to hand launch. After several catapulted test launches to make sure it was flying straight I launched it slightly to the right of the breeze and after climbing out to about 30 feet it cruised fast in wide right hand wide circuits that covered most of the free flight area landing just inside the far hedge. 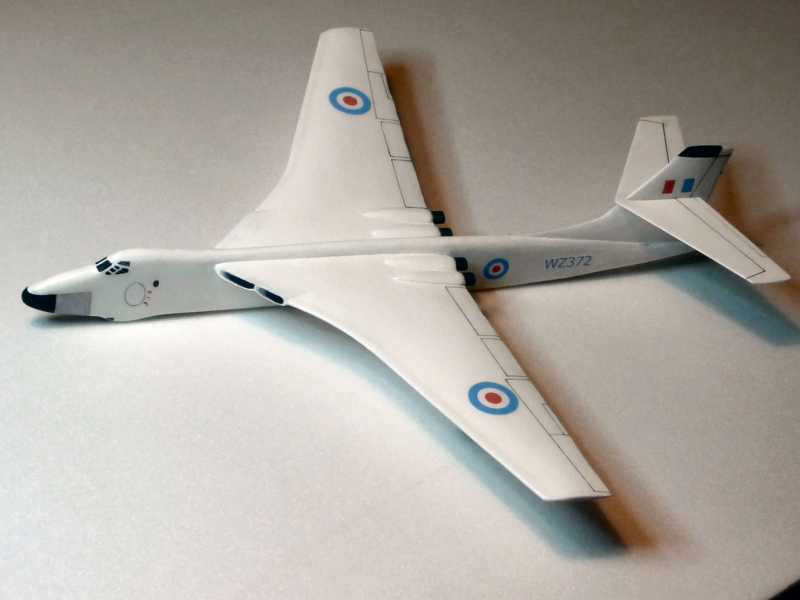 Phew, I have not flown it for many years and it really surprised me how stable and smoothly it flew in that wind for such an unlikely anhedralled model layout. I got quite excited! Above: Howard's F-104 flew splendidly and stably despite the anhedral. It looked great in the air as well. Perhaps Howard will now make one which isn't 'au naturel'? There are many fantastic colour schemes out there! The second contender was the last Mig 29 flight, I hand launched it banked slightly to the right, usually it then does circuits in the same turn but this time as is it climbed out to the right ahead of us it changed and curved round to the left. Continuing the turn it dived down back towards us and made a fast low pass over the flight line then up and to the left to cruise in smooth fast and wide left hand circuits leaving a faint smoke trail looking very much like the real thing. The model transitioned seamlessly to a satisfyingly long straight glide landing just inside the hedge, phew again. Above: It was also great to see the Viggen fly with the latest batch of L-2X motors. Mark and myself have finally found the time to edit the video he had taken on the Saturday of the Scale weekend and it should be posted below. As you will see one of, if not the best flight of the day, had to be Rogers Jetex equipped P-80 Shooting Star deserving of the applause you can hear at the end of the flight. I to took the opportunity to relieve Dr Zigmund of a few motors, a batch of L1s and L2-LTs. I tried some of the 70mN rated L1s in my profile Junkers EF-128 and enjoyed a couple of high speed exiting flights. You can clearly see the difference between flights with the new motors and some older 50mN motors in the video, those towards the end are with the new motors. A few weeks now to prepare for Peterborough and the next Old Warden when I hope to finally have something new to fly. A huge thank you for capturing the flying antics so well. Half the time I had no idea the camera was rolling, I thought the memories were lost but relived here with much enjoyment. Well done for getting the rocket flights, I know it's a bit of a departure using estes power but why not. It was mostly a fun day, well, until it was time to go home. Echoing Andy, a huge thank you to Mark and John for making this video, which captures some of the atmosphere of what was a very good flying day. Some of the flights need an 'X' certificate - what I hadn't realised at the time was quite how turbulent OW can be, resulting in our little models being 'shot down' at worst and stalling, spinning and generally miss-behaving at best. Note the cavorting of the Cutlass early on in the video, the MiG 15 and Andy's Alpha Jet - it's a reliable flyer and doesn't usually misbehave! The thermally-induced breezes too could catch us out with launches in the (slightly) wrong direction causing a turn from which our metastable models usually don't recover. I was glad to have a good flight with the Isacson 'Star' one of the great man's early designs for Jetex 50 and was well pleased with the Keil Kraft 'Shadow' Shooting star propelled by 50-60 year-old Jetex motors and original ICI (60 year old) pellets. They give a smoother, less smoky and quieter flight than Rapiers. More please! For me the other highlights were Andy's maiden flight of his Red Arrow's Hawk and of course the antics of his T-38. John's Sabre and Junkers flying wing did make some great flights - not all sorties ended up smoking on the ground! Here's to Peterboro Flying Aces! PS also hadn't realised how noisy OW can be - at the time one tended to just ignore it, but its oh so obvious on video. PPS any chance this video (and the previous one) could be also posted on our own 'jetex.org' You Tube channel for posterity and beyond?